Kevin O’Leary, a.k.a. Mr. Wonderful, drove home the point there are winners and losers — in business and in research. 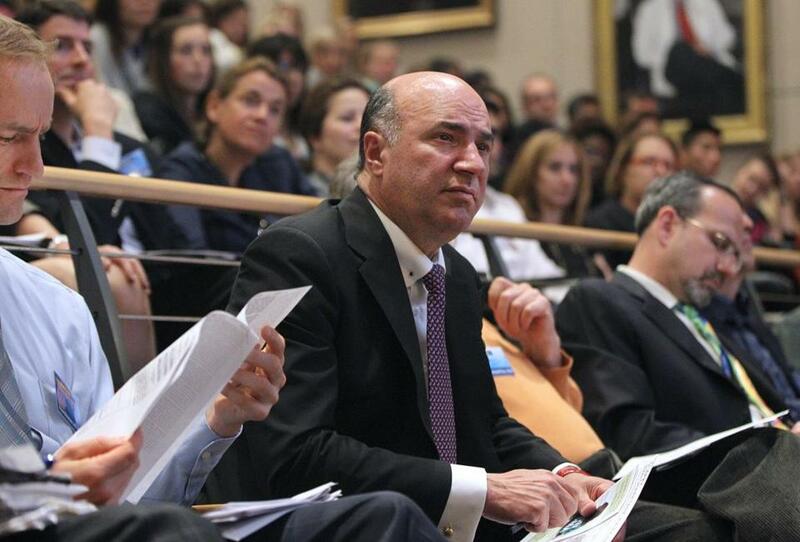 Kevin O’Leary, the Boston venture capitalist known for his no-nonsense style on the ABC television show “Shark Tank,” did nothing to dispel his reputation as a ruthless, money-loving businessman when he appeared at Brigham and Women’s Hospital Wednesday. In the world according to O’Leary, businesses are supposed to make money, period, not solve the world’s problems. O’Leary was part of a panel of venture capitalists and scientists who participated in the Brigham’s version of “Shark Tank,” helping to select four research projects that will each receive a $50,000 grant. Admittedly, the projects aim to solve some big problems in medicine, but that’s all right with O’Leary if they make some money, too. The funding competition was designed to mimic the action on “Shark Tank,” where entrepreneurs compete for funding from successful investors. In addition to providing a little entertainment, said Dr. Christine Seidman, director of the Brigham Research Institute, the goal of the event was to help raise public awareness about the Brigham’s research arm — and ultimately to secure donations from philanthropists and other sources. The National Institutes of Health, a major funding source for the Brigham and other research institutions, has sustained budget cuts in recent years. Eight Brigham scientists were allowed to present five-minute pitches to the sharks. They were pulled from a group of nearly 70 applicants. The $200,000 in seed money, from the Brigham Research Institute, is intended to help the four winning scientists continue with promising research at a time when federal support is shrinking. “We can do a lot in a year with that amount of money,” said Tracy Young-Pearse, who impressed the judges enough to win funding for work that could lead to the development of better Alzheimer’s disease treatments. ■ Aditi Hazra, who is studying breast cancer cells to help prevent unnecessary chemotherapy and radiation treatment in patients who don’t have invasive cancer. ■ Dr. Benjamin Humphreys, whose work involved fibrosis, or scar tissue, which can lead to organ failure. ■ Jeff Karp, who is experimenting with ways to stabilize gut bacteria, which could help treat or prevent ailments like inflammatory bowel disease or intestinal infections. The sharks didn’t hold back, asking pointed questions about the science of each proposal, as well as the commercial viability. But overall, they were impressed. They spent almost half an hour privately debating who should receive funding before announcing the winners. “It’s hard to pick four among those eight, I think that’s why we all struggled with it,” said Bill Geary, a partner at Foundation Medical Partners, a venture capital firm. Before the scientists took to the podium to make their pitches, they got a dose of advice from O’Leary, who is sarcastically known as Mr. Wonderful on “Shark Tank” because he is not concerned about offending people with blunt advice. “Don’t screw up,” he said. O’Leary said that successful presenters can always do three things: explain their pitch in 90 seconds, tell why they have the right people to execute their plan, and show that they know their numbers — costs, sales, market size, and the like.